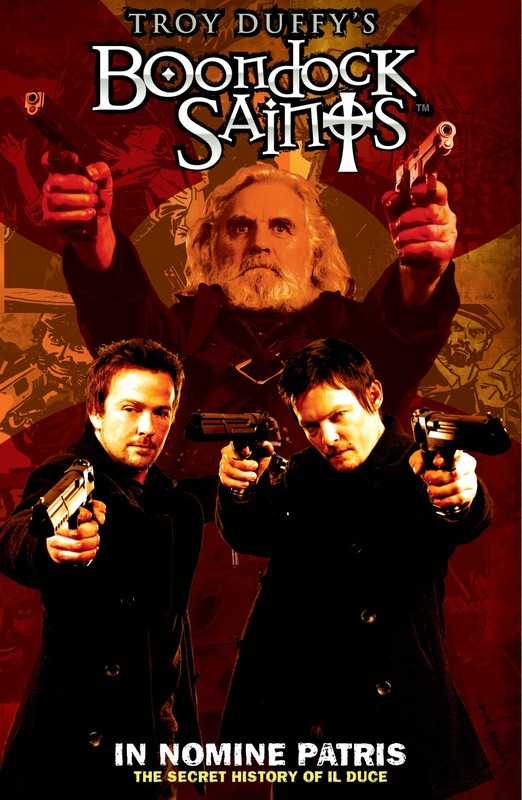 Boondock Saints ends with “man on the street” interviews discussing whether vigilantism is evil or awesome. Considering the debate going on these days about police shootings, I think it’s safe to say that more shootings of "bad guys" by random people would not be a good thing. I wouldn't think it’s at all difficult to make a Biblical case against vigilantism,but the church in the film doesn't seem interested in making it. 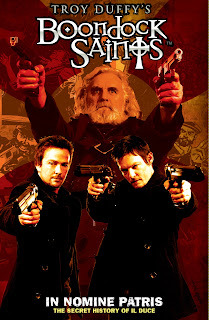 Of course, that kind of a stand might make the Saints, twin brothers Connor and Murphy MacManus (Sean Patrick Flanery and Norman Reedus), uncomfortable. The film opens in a church (filmed in Trinity Church of Boston, built in the 1870's) with a large crucifix and a large eagle at the pulpit. The congregation is reciting the Lord's Prayer. The priest (we learn he’s a monsignor) cites the story of Kitty Genovese, the woman in New York who was stabbed to death while her neighbors watched and did nothing. Problem is, much of the story has been dismissed now as an urban legend. He urges the congregation to not be bystanders but to get involved. The twins take this message as an endorsement of their lifestyles. I tend to think the sermon is more about reaching out to help people rather than an encouragement to track down drug dealers and mob bosses and shoot them in the head, but it's probably just a challenge of exegesis. Anyway, Connor and Murphy are two regular guys who work in a meat packing plant. They're assigned to train a new woman at the plant. When the woman accuses a brother of making sexist remarks and slaps him, he slugs her in return. If there was ever a case that called for turning the other cheek (Matthew 5:39), this would be it. Surely the boys heard about this Scripture sometime in their church experience, but they don't live it out. Later, when they get in a barroom brawl with mobsters, they can at least make an argument for self-defense. When those same mobsters make an attempt on their lives, killing the mobsters could be justified theoretically under Augustine's Just War Theory. But then the boys go on a rampage of killing mobsters in general. From a Biblical and theological perspective, well, that isn't cool. One FBI agent (Agent Smecker, played by Willem Dafoe) is smart enough to figure out who’s responsible for the crimes and is on their trail. The Irish brothers’ Italian friend Rocco (played by David Rocco) follows the agent to a church. Smecker enters a confessional. 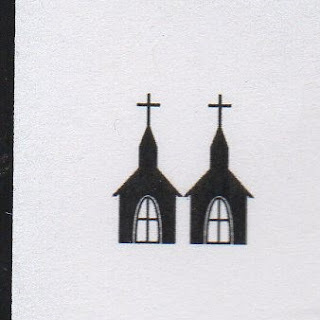 Rocco is concerned Smecker is going to ask the priest about the Saints, so he puts a gun to the priest's head. Connor doesn't like seeing anyone threaten a priest, so he puts a gun to Rocco's head. Turns out, Smecker wanted to ask the priest for advice. He says he didn't come for "advice on salvation, but ethics." He tells the priest he doesn't want to go after the Saints, because they're doing good work. The priest responds, "Our consciences are God's conduit for speaking to us. That's why God brought you to a house of the Lord. You feel these men are necessary... So the Lord has spoken to you twice. It's very easy to be sarcastic about religion, but it's more difficult to take a stand." The agent responds, "I am man who's supposed to uphold the law." The priest says, "The laws of God are higher than the laws of man." 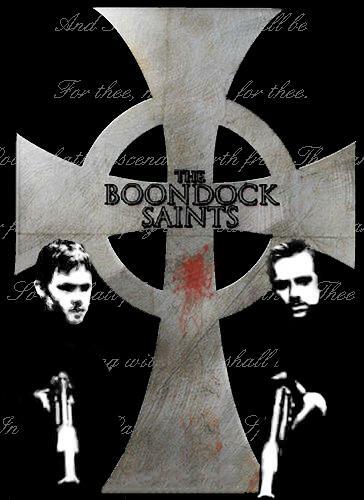 The agent takes this as permission to allow the Saints to remain on their villain-killing spree. On the other hand, I've never had to give pastoral counseling with a gun to my head, so who am I to judge? The Boondock Saints pray before their acts of vengeance, and they believe they’re instruments of God. Too bad they didn't get a little more clear teaching from the Church that it just isn't so. Of course, it could be they just didn't listen. Anyway, I'm giving the Boondock Saints’ Movie Church Two Steeples.